It’s become very trendy to tear down offensive statues in America these days. According to previous IJR reporting, a Confederate statue in Durham, North Carolina, was ripped to the ground by a mob of progressive protesters. The protesters cited the statue’s racist, violent symbolism for their actions. If we as a society are going to begin the process of tearing down statues of terrible people, there should be absolutely no argument against tearing down a number of Vladimir Lenin — who was Jewish — statues which proudly stand in America today. 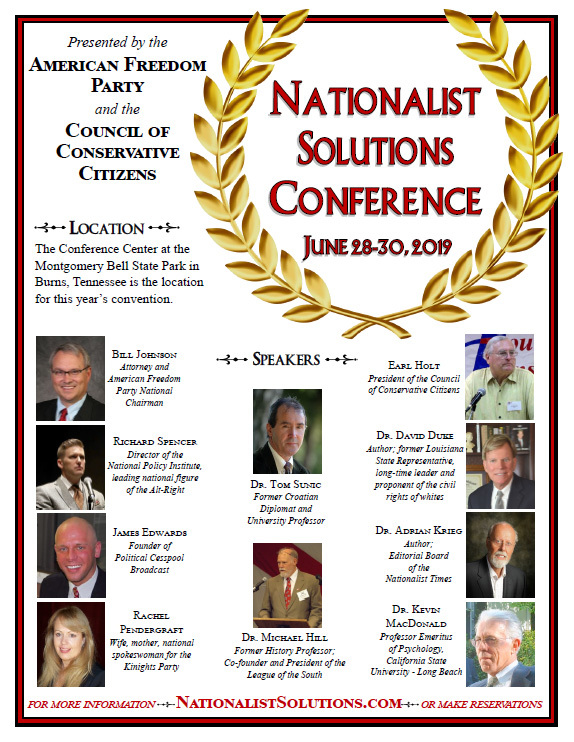 Here is a little background on the Soviet leader, just so we’re all on the same page as to what a monster Lenin was, and why his likeness does not deserve space on any American street. The oppressive Soviet regime came to power through a bloody coup in 1917 and exercised a death grip over most of Eastern Europe after World War II. The Union crumbled in the late 1980s, leaving in its wake broken, fractured nations and a horrific logbook of deaths. The war histories website, Necrometrics.com, has averaged academic reports on the overall arc of the Soviet Union and come to this conclusion: 56 to 62 million “unnatural deaths” for the USSR overall, with 34 to 49 million under Stalin. 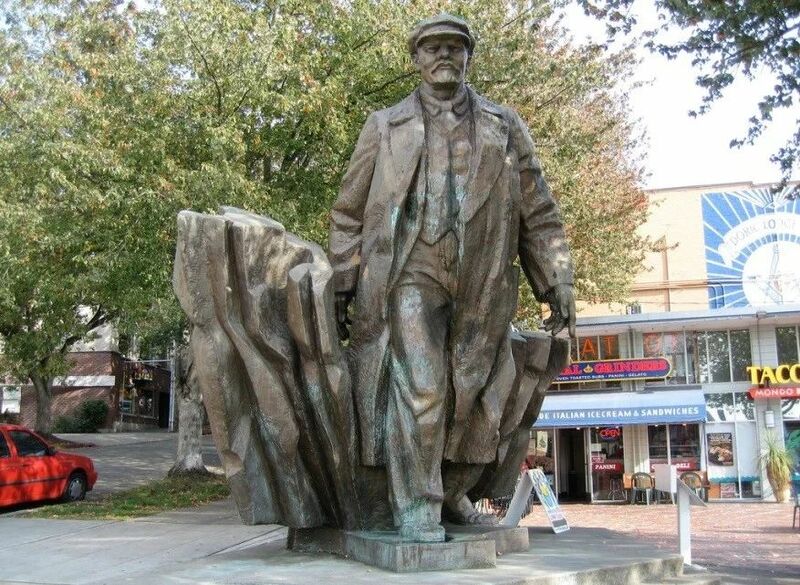 This 18-foot Lenin statue carries quite the history. It was originally commissioned by the USSR, but the implosion of that country in 1989 – the year Red Square was built at 250 East Houston – prevented its display. The developers of the property, Michael Shaoul and Michael Rosen, reportedly found it trashed in a backyard just outside Moscow and installed it five years later. 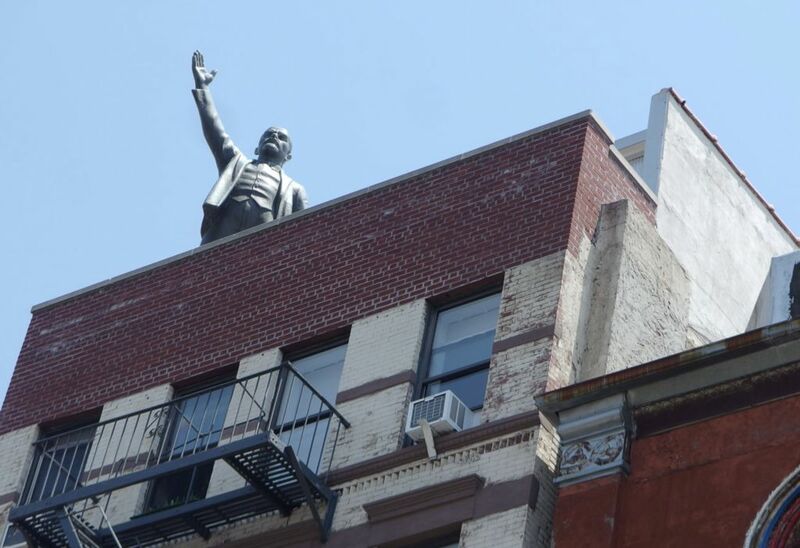 Indeed, it somehow seems fitting, given the current political climate, that a statue of the Russian communist revolutionary would return to a Lower East Side rooftop. And so it goes. Early Friday afternoon, workers were spotted hoisting the eighteen-foot, Soviet-era sculpture into place at 178 Norfolk Street. The copper tribute had been leaning on its side here since last September. Michael Rosen and Michael Shaoul, co-owners/developers of the original Red Square, where the statue held court from 1994, reportedly own this walk-up tenement beside the Angel Orensanz Center. 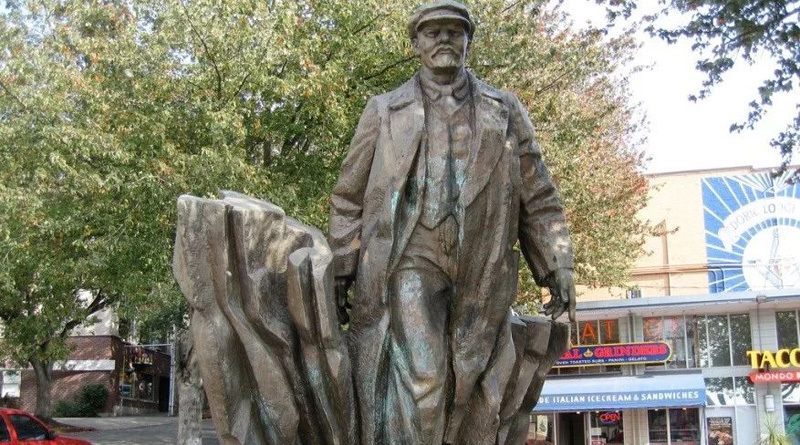 The path to Seattle from Poprad, Slovakia, for this 8-ton bronze of the Communist revolutionary occurred because Lewis Carpenter of Issaquah saw it, bought it and brought it back after the collapse of the Soviet bloc. He died in 1994, but the family still owns it, and Jon Hegeman, with the Fremont Arts Council, says it’s still for sale for $250,000 or best offer. The 16-foot Lenin, striding boldly and backed by flames and firearms, still evokes strong responses, though he died 91 years ago. Lenin was responsible for untold deaths, and many equate him with Hitler and Stalin. Vandals often paint the statue’s hands blood red. 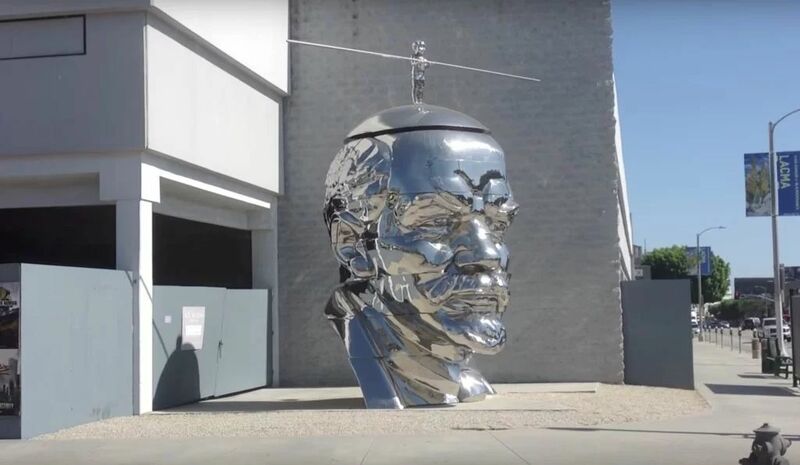 At some point in the last six years, you may have driven down La Brea Avenue and spotted a large metallic bust of Vladimir Lenin with a smaller version of “Miss Mao” on top of his head with a balancing pole. You have probably wondered what it is, why it’s there, and to whom it belongs. The first two questions are better left for another time, but the statue, named “Miss Mao Trying to Poise Herself at the Top of Lenin’s Head”, was created by the Gao Brothers, and has been on display with the Ace Gallery since 2011.